There is no question… Thanksgiving is an awesome time for families and giving thanks. However, if you have a kid with sensory processing disorder or any child that struggles in large crowds, thanksgiving can leave you feeling very unthankful. 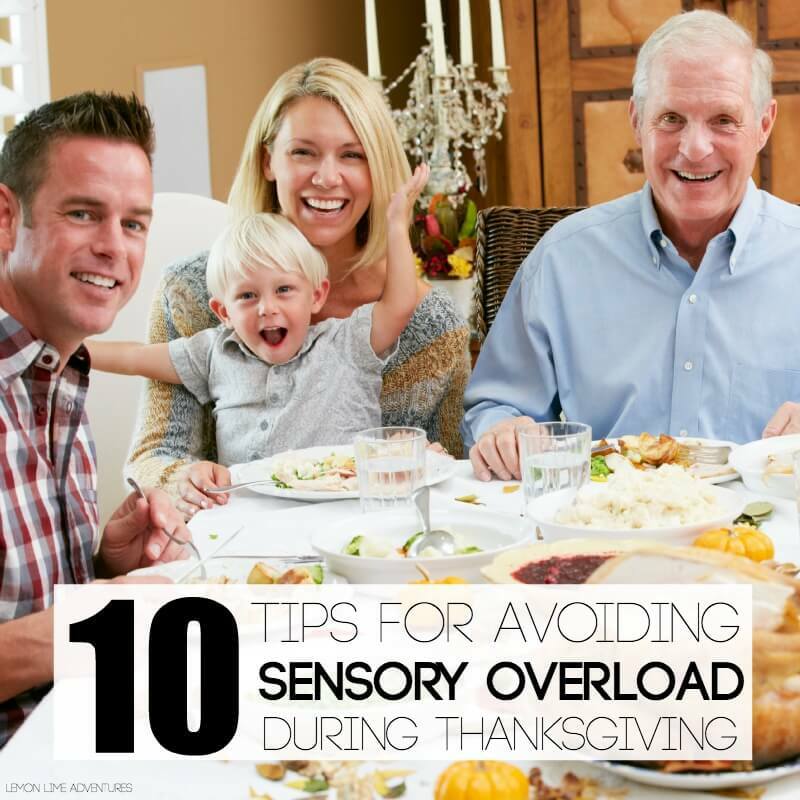 However with these top 10 tips for avoiding sensory overload at Thanksgiving, we can go into the holiday weekend ready for anything and ready to give thanks. For most families, Thanksgiving means big meals, happy family gatherings, and maybe even lots of fun fall activities together with the family. For most families, this is an extremely joyous part of the year and they look forward to it all year. However, if you are anything like my family (which is probably why you are reading in the first place), Thanksgiving can bring about some stressful emotions. How will he handle the new people we meet? What if he is unruly at Grandma’s house? These are just a few of my worries as we near Thanksgiving. Luckily, over the past two years, I have learned a few sensory tips that help us when we head into a new holiday season. I’ve gathered a few of my tips, here. Educate Yourself on Sensory Needs | Did you know there are more than 5 senses? Thanksgiving is a time of year when all of the senses are challenged. From the smells in the air to the new foods at the thanksgiving table, our bodies are trying to regulate all of the input around us. Knowing about and understanding basic sensory needs and how the sensory systems affect our bodies is the first step to being prepared. Try the Foods Ahead of Time | Thanksgiving dinner is full of tons of foods your child might not like, might not try, or might down-right refuse. Knowing your child’s likes and dislikes ahead of time can be extremely helpful. When everyone is making suggestions on what to bring, you can offer to bring something you know your picky eater will eat. Try something from this mega-list of table foods. Review Calming Strategies | There are usually a lot of people at thanksgiving dinner. Reviewing calming strategies before hand is a great way to prepare your child for an overwhelming environment. Here are over 15 tried and true ways to calm an anxious child. Ask for a Calm Down Retreat or Make Your Own | If Thanksgiving is being held at Grandma’s or Auntie’s house, ask ahead of time where a good quiet place can be for your child to calm down. You want a place away from people, away from the possibility that others might ask what is wrong, and a place where your child doesn’t feel like they are missing out. If they don’t know of a good place, you can make a place when you get there or better yet, offer to have Thanksgiving at your house, so you can control the environment. We love our Rocket Calm Down spot, but you could easily make it without the cardboard box. Prepare Your Child for the Change in Routine | This is hard for many children (not just those with sensory processing disorder). Thanksgiving dinner is often at a different time than they are used to eating. Their normal routines are abruptly changed. You can prepare your child by making a new visual schedule or calendar that provides the child with pictures and predictability. This helps children know what might be coming next, and reduces anxiety and meltdowns. Bring Along a Sensory Kit | We do not go anywhere without our sensory kit. We have worked the last two years to find exactly what helps in stressful situations, and our kit contains everything we need from noise-reducing ear muffs to a maze book for calming visual input. Lots of Heavy Work | I always say that when I discovered heavy work, it was like the clouds parted for me and my child. Our first heavy work activity we ever tried was wheelbarrow walks. Any time he was getting rambunctious or struggling at a relative’s gathering, we would go to a quiet place and do wheelbarrow walks. It was great because others thought we were just playing a fun game, but it provided the proprioceptive input my child needed. Here is a list over over 30 calming heavy work activities. Don’t Expect the Hugs | Be okay with your child no giving hugs. It can help to prepare your relatives ahead of time so they will not think your child is being rude. Here are some great alternatives to giving hugs to relatives. Audio Books | I kid you not, when I tell you that these have been a life saver! If your child seeks auditory input but gets overwhelmed around many people.. this is perfect! They can listen to their books on their kindles or favorite devices, while still walking around the party or being around grandma and grandpa. And guess what? They are learning, too! Bring Wine | Okay, okay… this one is just for mom! But sometimes you need to have fun, when life is so serious, right? So get your favorite drink, be it coffee, tea, wine, or a fall cocktail… and relax… it will be okay! Here are more than 25 more tips for surviving the holidays without sensory overload. Just remember, you are not alone in this adventure! In fact, I have a sensory support group with almost 5,000 other parents and caregivers who are in the same position as you! I’ve joined several of my favorite people to bring you our monthly Top Ten lists! 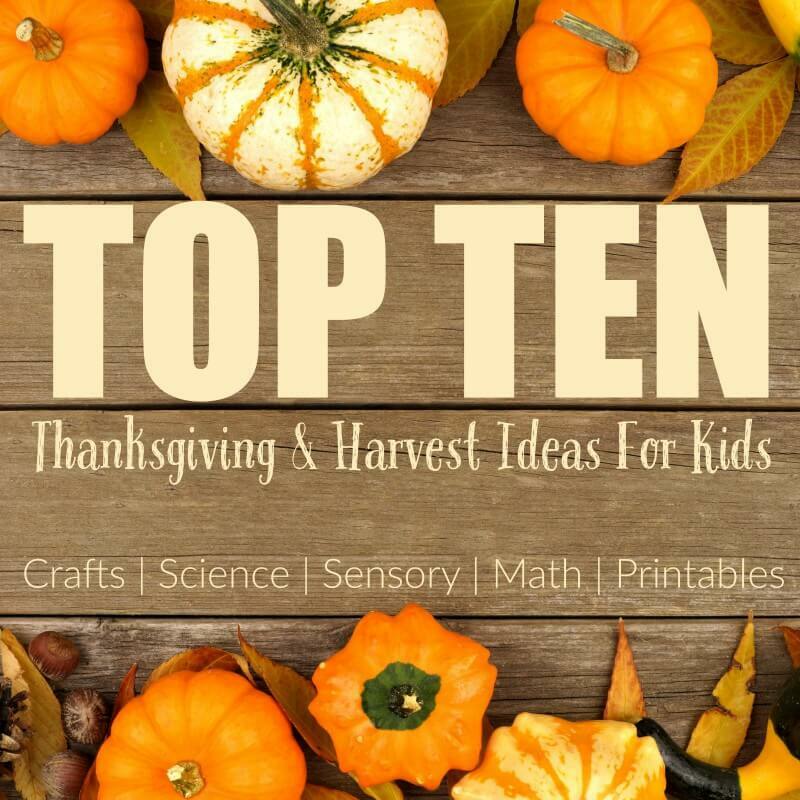 This month, everyone is sharing a Top Ten list for anything and everything Thanksgiving and Harvest. There are more than 150 ideas represented here! How cool is that! 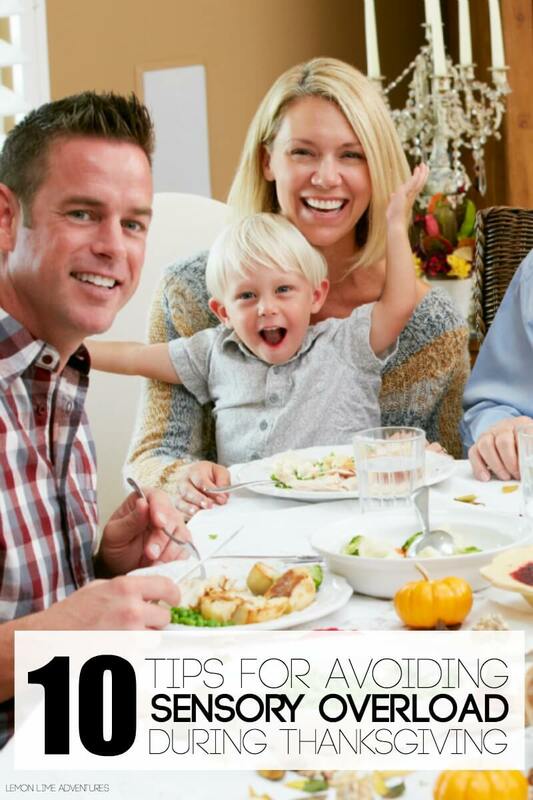 What would you add this this list Thanksgiving Tips for Avoiding Sensory Overloads? Which one is your favorite? I would love to hear all about it! I can’t wait to see! Connect with me on Facebook, Twitter, Google+, Pinterest, Instagram or subscribe by email so you don’t miss our next adventure. If we’re visiting, we also try to arrive early. When we’re one of the first ones there, it seems easier for our daughter for people to cope with people trickling in rather than walking into a crowded room! That is a great tip! I agree that can be super helpful! How I contact with you Dyana? thank you! Can you email me at dayna (at) lemonlimeadventures (dot) com.